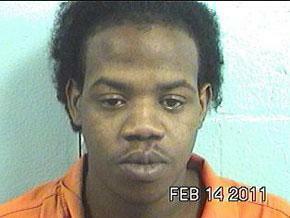 Cordell Green, 23, of Livingston, pleaded guilty in the middle of his murder trial and was sentenced to life in prison. Suspect Pleads Guilty in Dorris Murder Trial, LIVINGSTON, May 23, 2012 - Following two days of testimony in his trial for capital murder, 23 year old Cordell Renard Green, of Livingston, elected to change his plea to "guilty" and received a sentence of life in prison to the charge of first degree murder. The charge and conviction stemmed from the December 30, 2010 killing of Heather Nicole Dorris, age 25, of Livingston whose body was found in the early morning hours lying on the Old Woodville Road east of Livingston. Following nearly two months of investigation by the Polk County Sheriff's Department and Texas Rangers, Green was arrested in Nacogdoches on February 14, 2011 by the Gulf Coast Violent Offenders Task force following a five day manhunt. During the investigation, several individuals were investigated and ruled out as suspects before evidence connecting Green to the crime was uncovered. After jury selection on Monday before Senior District Judge David Wilson, Polk County District Attorney Lee Hon presented multiple witnesses who testified regarding the initial crime scene investigation as well as members of the victim's family who had last seen her on the night before her murder. Although witnesses observed Dorris in a confrontation with another individual at an apartment complex on Mimosa Street in Livingston on the night of her death, an eyewitness testified that he saw Dorris allow Green to get into her vehicle sometime after midnight along Martin Luther King Street. Dorris's body was found at approximately 6:45 a.m. the same morning. Harris County Assistant Medical Examiner Albert Chu testified that Dorris sustained seven gunshot wounds, two of which were lethal. Harris County Sheriff's Firearms Examiner Jill Dupree testified that the projectiles recovered upon autopsy were likely fired from a .22 caliber weapon. The murder weapon was not recovered during the investigation. Prosecutor William Lee Hon speaks with family members of Heather Dorris at the conlusion of Wednesday's hearings. Polk County Sheriff's Captain Rickie Childers and Texas Ranger Sergeant Ron Duff testified on Tuesday regarding the progression of the investigation and how, through tips from informants, Green became a suspect in the investigation. In early February of 2011, investigators received numerous tips that following the shooting, Green had fled to Houston where he confided in several others that he had committed the crime. Cell phone records from Green's phone and others established that contrary to his initial alibi, Green was not in Lufkin but rather in Livingston at the time of the killing. Other witnesses also refuted Green's alibi and shared information with detectives regarding his admissions. According to Hon, Green indicated through his attorney early Wednesday that he would waive his right to continue the trial, and any right to appeal his conviction, in exchange for an agreement by the prosecution to allow him to plead guilty the offense of first degree murder. After discussing the proposal with family members of the victim, Hon stated that the plea was entered by Green and approved by Wilson. According to Hon, under Texas law as it applies to the offense of first degree murder, Green will serve a minimum of thirty years in prison without any credit for good behavior before he may be considered for parole. "This was a really good investigation by our sheriff's department and other assisting law enforcement agencies," Hon added. "They took their time, ran down numerous tips, and ultimately put together a strong case where all of the credible evidence pointed directly toward this defendant," Hon stated. "While it's not all that common to have a defendant change his plea in mid-trial, in this instance the evidence was methodically stacking up to the point where I think this defendant realized he needed to resolve this case," Hon concluded. During impact statements, as family members spoke directly to Cordell Green and spoke their piece about the murder of Heather, Green would start sobbing frequently, at times seemingly uncontrollably. After Green pleaded guilty, he stated to the family that he has prayed for forgiveness since the day of the murder, but that he feels God wont forgive him until the family forgives him. One family member stated to Green that he had forgiven Green, another family member stated to Green "...you have hurt this family more than you'll ever know, I hope you burn in hell, and I don't forgive you".